1916 Barret Manual High School, Undefeated & Un-official Kentucky State High School & National High School Champions. 1st Row Left to Right: Team Captain: R.F. Cottingham, William Spoehr. 2nd Row: William Gardner, C. Green Fitz-Hugh, Harry Jones. 3rd Row: Anthony Dishman, Coach: W.R. Leker, Unidentified, Taney McGee. 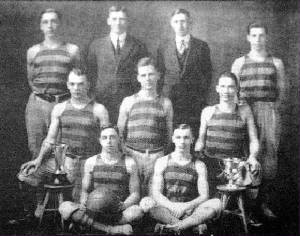 The 1916 Barret Manual basketball team under Coach W. R. Leker won the first Kentucky State tournament in 1916 at Centre College. At that time it was only an invitational state tournament. Barret is one of only three Kentucky high schools to ever win the Kentucky High School state tournament in an undefeated season. This 1915-16 Barret basketball team was not only undefeated in 12 games, Barret Manual won the first national basketball tournament and defeated Parkersburg, WV at Athens, Ohio 38-32 for the recognized national basketball title. However most sources will not acknowledge the Barret state championship because the KHSAA didn't come into existence until a two years later in 1918, at which time the KHSAA took over the state basketball tournament. One other undefeated team was the 1928 Ashland High School Blazers. The 1928 undefeated Ashland team is also only the second Kentucky high school to win the National High School Championship. The 1916 Barret High team was the first Kentucky school to win the coveted National title. The third & the last team to go undefeated in Kentucky high school was the 1948 Brewers High School basketball team from Marshall County in Western Kentucky. Brewers High School led by all-state performer Mason Cope, went to the Kentucky state finals from 1944 through 1948, before finally winning it all in that undefeated season with a record of 29-0. After a brief military stint, Cope teamed up with former Barret star Don Gish & former Wayland star Kelly Coleman at KY Wesleyan to finish as national runners-up in the NAIA National Finals tournament. The only time in KHSAA tournament history that two undefeated teams have ever met in the the State semifinals was in 1933. Horse Creek (24-0) defeated Hazel Green (25-0) 42-41. Neither team won the state tournament that year. member of the 1912 Barret track team as an eighth-grader.